Dana White To De La Hoya: If You Want To Battle, I’m Your Guy! 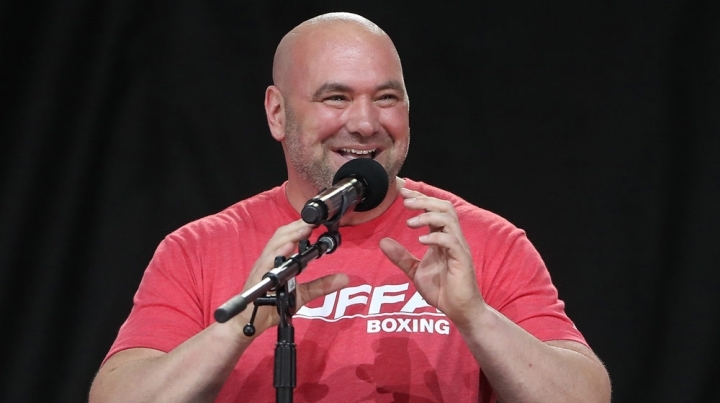 UFC President Dana White has no issue going head to head with Golden Boy Promotions CEO Oscar De La Hoya. White and De La Hoya, who were once friends, are now bitter enemies. Their rivalry began back in 2017, when De La Hoya tried to rally the public to boycott the Showtime Pay-Per-View clash between Floyd Mayweather and UFC superstar Conor McGregor. Things were quiet for a few months – until De La Hoya entered the MMA market with his first Golden Boy MMA pay-per-view – which saw a trilogy bout between Tito Ortiz and Chuck Liddell. De La Hoya has promised to make an even bigger push into the MMA market in the coming year. In the aftermath of Saturday’s UFC event, White explained how the rivalry began. Recently, De La Hoya challenged White to a physical fight in the ring. White is not interested in meeting De La Hoya in an actual fight, but he plans to go head to head with the former champion in a battle of business ventures. White is still moving forward with getting his planned boxing company, Zuffa Boxing, off the ground – and he warns that his boxing venture will outshine De La Hoya’s Golden Boy. ”See what we do this year. Wait til you see what happens with Oscar De La Hoya in the next three years. You guys know me, some of you have known me for a long time. You wanna battle? I’m your guy. I’m your guy. Let’s do it,” White said. Arum: Joshua Damaged His Credibility, Fury Viewed as #1 in U.S.
Spence vs. Garcia: Fans or Family?